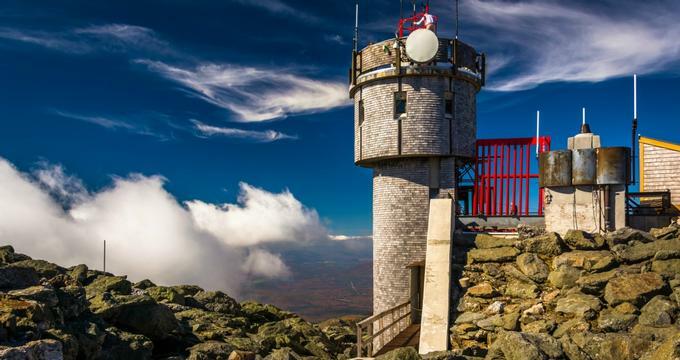 Located atop the summit of New Hampshire’s Mount Washington, the Mount Washington Observatory is a nonprofit research organization dedicated to meteorological observation, offering public tours and educational programming for student groups. The history of weather observation at New Hampshire’s Mount Washington dates back to 1870, when a group of scientists embarked on a mission to scale the peak for the purposes of winter weather data collection. As a result of the mission’s success, the United States Signal Service, the predecessor organization to the National Weather Bureau, began conducting observations and collecting data at the site from 1870 through 1892. After a hiatus in the early 20th century, the station was reopened under its current organization, governed by the state of New Hampshire, and began collecting data again in 1932. As the first weather station of its type in modern history, the observatory became a model for similar weather stations throughout the world, utilized by a number of international governments for the purposes of collecting and studying climate data. Several notable weather records have been observed at the station throughout its history, including a 231-mile-per-hour wind gust recorded in 1934 that maintained world speed records until 1996. The observatory is known by its humorous slogan “Home of the World’s Worst Weather,” a claim with origins in a 1940 article written by observatory co-creator Charles Brooks. Today, the Mount Washington Observatory is operated as a public nonprofit educational facility, dedicated to collecting data in order to further understanding of the Earth’s climate patterns and trends. Though many unstaffed weather stations around the world have been modernized with advanced technology, the observatory’s temperature and humidity data is still collected using the traditional sling psychrometer technology utilized since its inception, providing one of the most precise unadjusted climate records in the world. As a nonprofit organization, the observatory is operated under the governance of the state of New Hampshire, with additional support from partner corporations such as L.L. Bean, Subaru, Eastern Mountain Sports, and AccuWeather. Guided public tours of the observatory’s 6,288-foot-elevation weather station, located within the Sherman Adams Visitor Center in Mount Washington State Park, are offered by observatory scientists, educating visitors on the station’s data collection process and allowing observation and interaction with forecasting and collection instruments. An Extreme Mount Washington educational program is also hosted at the Visitor Center, offering information on the area’s noted extreme weather conditions. Tours are offered between May and October, with advance reservations recommended due to limited staff availability. All tour participants must become museum members of the observatory prior to booking tours. The summit observatory is also the home of the Mount Washington Museum, which showcases the area’s natural and social history through a variety of exhibits and interactive multimedia presentations. For easier accessibility to the station’s resources, the Mount Washington Observatory Weather Discovery Center is located in the heart of downtown North Conway, offering an interactive museum for visitors of all ages. Interactive exhibits highlight meteorology and physics principles with activities such as an air cannon, wind room, and flow tank, and opportunities to videoconference with observers working at the summit station are provided through the Live From the Rockpile exhibit. The Gladys Brooks Memorial Library, located on the museum’s lower level, also holds an extensive collection of historical and scientific volumes related to the White Mountains area and the Earth’s coldest climates, including books, photographs, maps, and artifacts. Visitors may use the library’s collections by appointment or may visit during open library times on Thursdays. As a nonprofit research and educational center, the Mount Washington Observatory offers a wide variety of educational programming for visitors of all ages. Guided group tours of the Weather Discovery Center are available by appointment for small groups and organizations, including customized programming tailored to special group interests and needs. Tours last approximately one hour and are best suited for groups of 20 or less, though larger groups may be accommodated by advance request. In addition to field trip opportunities through the museum’s tour program, a variety of educational opportunities for elementary and secondary students are offered, including a classroom learning program tailored to New Hampshire curriculum standards, focusing on a variety of topics related to climate science and natural history. A distance learning program allows students to experience the extreme conditions on the summit observatory and learn about the work performed by observatory scientists using videoconferencing technology directly in the classroom. Camp-in programs hosted at the Weather Discovery Center offer overnight learning opportunities, and a Science in the Mountains lecture series provides continuing learning opportunities for adult visitors. A variety of Summit Adventures day trips and overnight camping opportunities are also offered to allow visitors to experience the conditions of summit observatory workers and participate directly in daily data collection activities.